HP Umpire Pat Hoberg ejected Yankees Manager Aaron Boone (strike one call; QOCY) in the top of the 6th inning of the Yankees-Rangers game. With two out and one on (R1), Yankees batter Gary Sanchez took a 1-0 fastball from Rangers pitcher Cole Hamels for a called first strike. Replays indicate the pitch was located over the outer half of home plate and below the midpoint (px 0.543, pz 3.416 [sz_top 3.467]) and that all callable pitches were properly officiated, the call was correct. * At the time of the ejection, the Rangers were leading, 6-1. The Rangers ultimately won the contest, 6-4. This is Pat Hoberg (31)'s first ejection of 2018. Pat Hoberg now has 4 points in the UEFL Standings (0 Prev + 2 MLB + 2 Correct Call = 4). Crew Chief Gerry Davis now has -3 points in Crew Division (-4 Previous + 1 Correct Call = -3). *This pitch was located 3.102 vertical inches from being deemed an incorrect call. This is the 45th ejection of the 2018 MLB regular season. This is the 17th Manager ejection of 2018. This is New York-AL's 5th ejection of 2018, 1st in the AL East (NYY 5; TOR 3; BAL, BOS 1; TB 0). 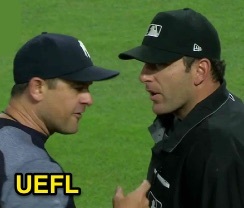 This is Aaron Boone's first ejection since June 13, 2007 (Brian Knight; QOC = U [Fighting]). This is Pat Hoberg's first ejection since September 1, 2017 (Adam Jones; QOC = Y [Balls/Strikes]).